I’ve been remembering my first experience in Walk Detention. 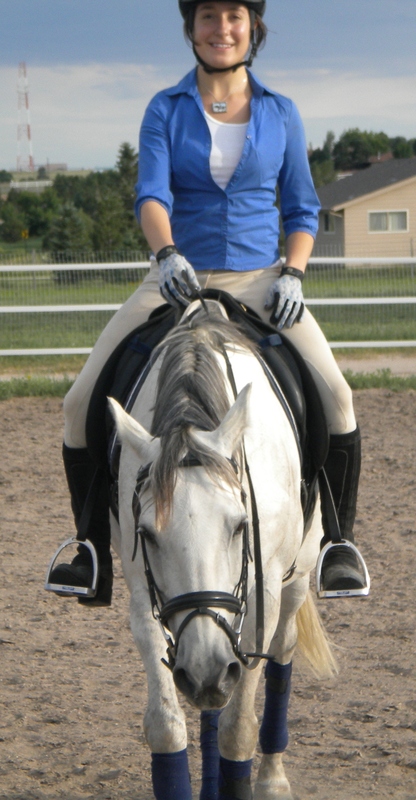 It was the dark ages and I was a training level rider on a young horse. I was so excited to ride in my first clinic with an Olympian- my enthusiasm sizzled audibly. I handed over a fat check, my horse was spit polished and I was in the arena with A Famous Trainer, ready for enlightenment. My horse and I entered at a walk, 50 minutes later we left at a walk, and in between- we walked. At first it felt normal to walk, but in a few minutes, I got self-conscious. Still walking? Was I so bad? The clinician didn’t call it Walk Detention- that’s my pet name for it. Walking felt dull, like an interim gait, a means to an end. It’s easy for a rider to be in a hurry to somewhere else and ignore the present. Being in Walk Detention gave me a chance to be/here/now with my horse. Once I got there, sadly, I had to admit it was new territory. So I swallowed my humiliation and pried my mind open. Soon, I was mesmerized with our walking meditation. My horse was responding to every movement of my seat, in a fluid, forward way. There was a peaceful rhythm that felt like effortless perpetual motion. No rush and no drag, just flow- and both of our minds met there. I had a conscious awareness of movement and partnership that felt brand new: walk euphoria! Awk! This gait best suited to watching paint dry was the passageway to an alternate universe- one with better balance. And I felt like an idiot… The lesson ended and I dismounted and thanked the Olympic rider, humble with my expanded reality. The Olympian asked if my horse was for sale, but I was certain she felt sorry for us, so I ducked my head and left the arena. I un-tacked, gave my horse an apologetic lunch, and shuffled back to the arena to watch the upper level riders. No one got out of the walk that day-regardless of the level of the horse or rider. My bruised ego took a small fluff from that. In dressage we agree: the walk is the most difficult gait, it’s primary and elite all at once. It’s the easiest gait to mess up and the hardest one to inspire. Learning to go slow is an acquired skill, especially with horses. All my clients reading this are smiling- they all know Walk Detention and some even ask for it- the miracle cure for all sorts of irregularities. The walk is the place we all fell in love, and it is the place all good things come together. Looking for a spring riding tip? How about some time in Walk Detention, where you have no place to be but with each other. The truth in these words brought tears to my eyes. They explain everything; what I so love about what we do most: walk. Walking with my horse was the balm that healed my broken body. No wonder it’s the pace that’s often used in therapeutic riding. Perhaps it contributes to our circadian rhythm … or something? My horse and I spend a lot of our trail time walking. And you’re absolutely right, I can FEEL it when we’re both moving like a well-oiled clock. Perfection and heaven both! Thanks. I needed that! Seriously! One of my horses has ‘the worst’ walk! It’s all about him. He sometimes doesn’t listen to what I am asking. You made me realize that If he doesn’t listen to me at the walk, why the heck should he listen at faster gaits? I think today is the perfect day to go out for a long walk! Thanks, again! Someone just posted a picture of working with a really nice horse. Unfortunately the horse was overbent, and they were using a running martingale. From my long ago experience, this horse would benefit from “long walk, loose rein” until he balanced himself. Think that might help with yours? I carry over as much Dressage training as I can to the dogs, but it’s sometimes difficult to explain to someone who has at most ridden the electric pony outside the drugstore about “light contact” and “ask them to shorten and extend their stride” Plus a lot of “walk them first” to get a dog to focus on the leash instead of charging around the ring off balance. And even your non-clients are smiling, Anna! Love it, been there, AM there!! I love that Nigerian proverb. The walk is actually my favorite gait. I’m building a list of exercises Misty and I can practice at the walk. It’s great for building confidence in both of us. And walking is my preferred gait for trail riding, which is my main goal. What’s that saying?…Happiness is the journey not the destination. What a wonderful post! A great reminder for us all. I have a wise guide who reminds me regularly that I HAVE TIME. Don’t hurry he says. You’ll miss it. Thanks for your wonderful way of reminding me this morning. Good stuff. As always.